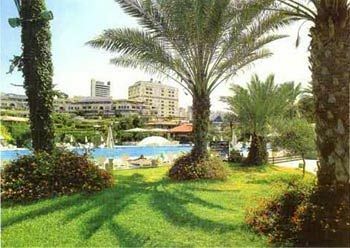 Portemilio Hotel , close to Our Lady of Lebanon, Teleferique Gondola, and Casino du Liban. Nearby points of interest also include Notre Dame University – Louaize and Jeita Grotto. The Portemilio boasts 180 guestrooms, including suites with kitchenettes, in addition to an Executive Floor and accompanying lounge that serves a healthy breakfast. It also carries newspapers and offers secretarial services. The Executive Suites are high on technology, with a sound system and DVD player, while bathrooms feature a Jacuzzi. Guests who book in suites also have free access to the health center. Conceived by noted designer Khuan Chew, the Portemilio concept reflects an oriental touch for a unique feel in the country, while the rooms themselves look out onto sea or mountain. There are many activities on the premises, such as the heated indoor swimming pool and the Olympic-sized outdoor pool. A fitness center is also available for the health conscious, so are tennis courts, a basketball court and more. Relax in the sauna after a heavy sports game.